A shuttered US government and local hotel worker's strike for better working conditions (what a concept...!) 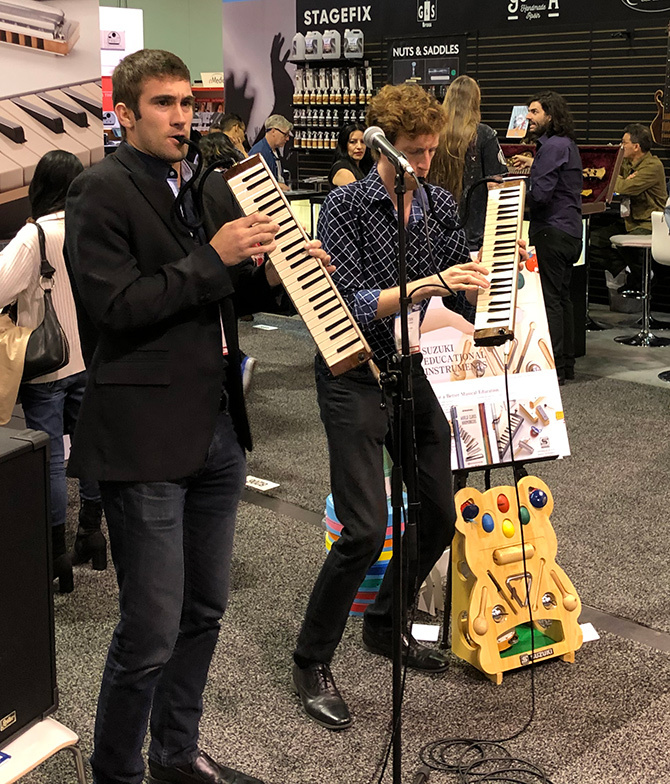 caused stress and traffic delays respectively, but couldn't dampen the mood of 2019 Winter NAMM Show participants. 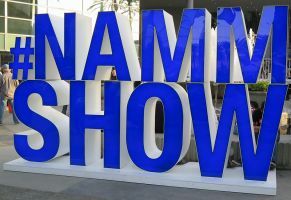 In the last few years NAMM has been making it easier to attend the show without being a member, so there were more music prosumers and consumers in attendance than past shows. All of the barriers were intelligently positioned to minimize security entry points, which was a welcome change from last year. The attendance at the show this year produced 115,000 registrants from 127 countries. There were over 2,000 exhibitors, representing more than 7,000 brands. NAMM would like to be all things to MI, but couldn't claim credit for re-opening the US government, even though it happened during the show. 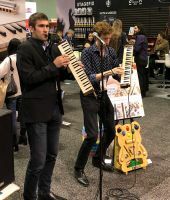 Software companies have returned in a big way to the NAMM Show. The ones that never left of course have better locations, there were a surprising and please number of first-time exhibitors. NAMM is taking on the education of both retailers and exhibitors with a number of programs. They have always offered this for retailers, but, with programs like A3E, they are trying to help product developers move forward as well. 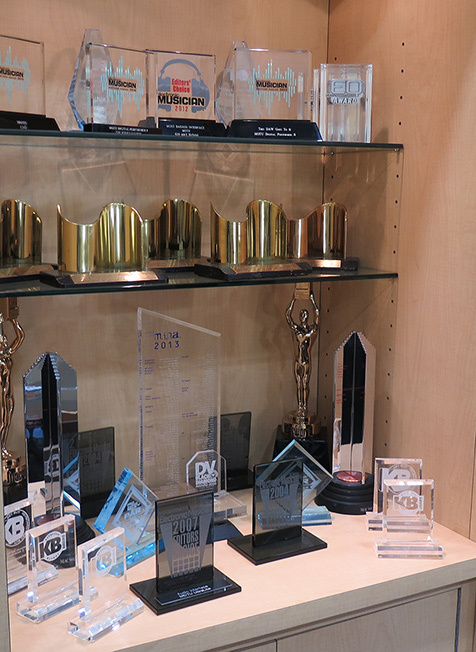 NAMM again hosted the TEC Awards, which brings a larger presence of Pro Audio companies, which in turn attracts an even broader range of industry people, prosumers, and yes, more consumers. The DIY modular system segment of the market is picking up momentum and a lot of the innovation in the industry is happening in the middle of, or on the periphery of the market. 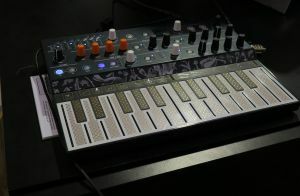 In at least one person's opinion, the most radical product of the show was MicroFreak ($349 / 299€ - ships April 1st, and they say that's no joke), another clever product from Arturia. One of the most striking features of MicroFreak is its innovative PCB keyboard. It's pressure sensitive and offers poly aftertouch. While it's not completely an MPE controller, it can be more expressive. Among many other features there is a multi-mode digital oscillator with an Oberheim SEM-inspired analog filter. 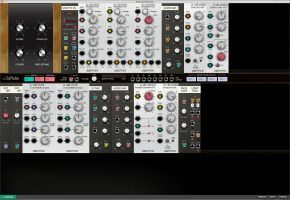 Like many Arturia's hardware products the MicroFreak has Gate and CV outputs for connection to modular systems. Arturia will make the unit capable of using additional oscillators through official firmware updates in the future. 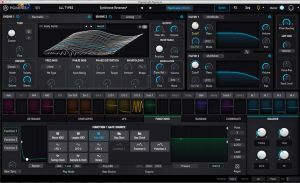 They were also showing Pigments ($199), their extremely full-featured wavetable software synthesizer. As far as we know it's their first homegrown softsynth. They should know what they're doing after emulating just about every commercial synth one can imagine. Your humble narrator was further humbled moderating the "Innovations in Modular Synthesis" A3E panel. An interesting trend in this segment is the presence of greater processing power within the modules. 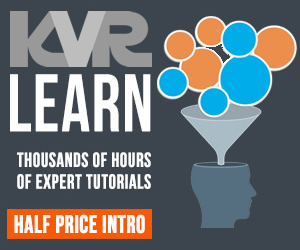 Perhaps this as an opportunity for the KVR developer community. One of the participants on the panel was industry veteran Pete Celli. His company, Strymon created an example of what can happen when more processing is added to a Eurorack with last year's first effort, Magneto. This year they were showing a further commitment to the Eurorack with the AA.1 Amplifier Attenuator ($199) that allows a user to interface their guitar, bass, or guitar pedals with a Eurorack System. And they are still making cool guitar pedals. The new Volante Magnetic Echo Machine ($399) is a stereo multi-head delay that also offers a looper and vintage spring reverb, with sound-sculpting controls for many sonic possibilities. Another panel participant, Bert Schiettecatte, from Percussa was demonstrating another good example. Their Percussa SSP system features a Quad core processor running at 1.8 GHz per core 32-bit SIMD and 64-bit floating point arithmetic. It supports recording audio inputs and outputs directly to an SD card for instant wavetable / sample creation or recording of live performances without the need for external software. Of course you could just create your modular system in software, like Softube's Modular, and Cherry Audio's Voltage Modular, both of which were being demonstrated in their respective booths. MPE products are spreading slowly.. Innovative hardware developer, Keith McMillen was showing their K-Board Pro 4 ($1195 MSRP). Each key on the standard 4-octave keyboard sends 5 independent mappable dimensions. There are 4 additional touch-sensitive sliders that are positioned above the keyboard. The K-Board includes a software application that allows a user to map everything. 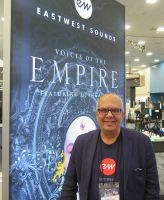 Back at NAMM for another go-around was EastWest. 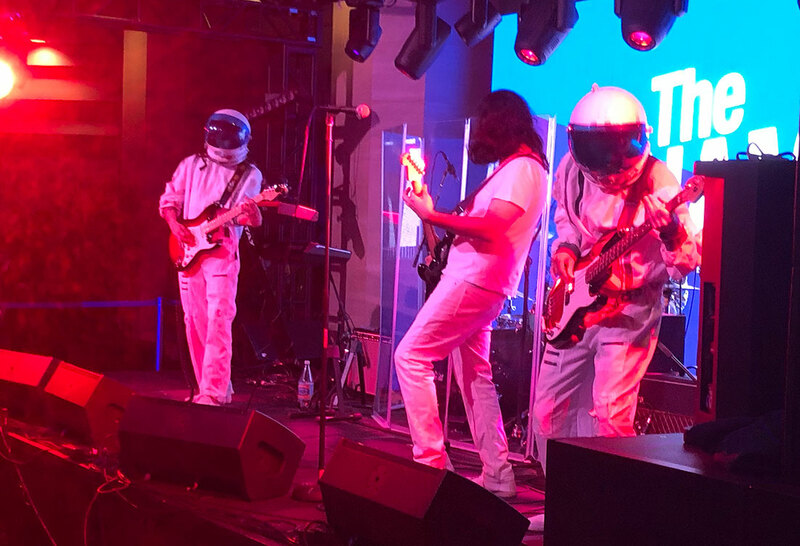 They added former Guitar Center hi-tech category manager Dinshah Sanjana to their team. Anyone who has sold tech products through GC knows him well. 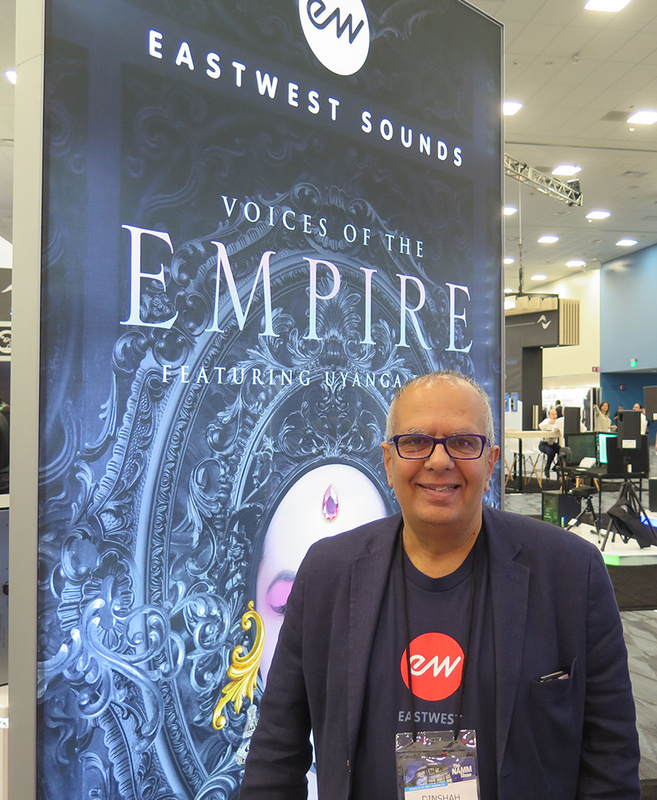 The combination of Dinshah and Blake Rogers has allowed EastWest's founder Doug Rogers to focus more on product development. The results are obvious. In addition to Voices of Soul, which was launched at the end of 2018, they were showing Voices of the Opera, and Hollywood Pop Brass. 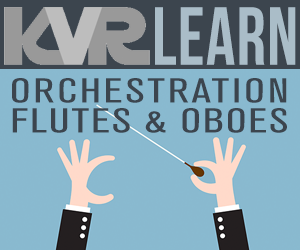 All of them will be available through the Composer Cloud subscription service. Special mention for product library of the show must be Eduardo Tarilonte's latest creation, Dark Era (€/$ 259.00) which was being demoed in the Best Service booth. The research that goes into Eduardo's libraries is impressive. In this case the voices range from Mongolian Tuvan throat singers to Inuit Tribal music. There will be a time limited (till end of March) crossgrade special for owners of any registered "ERA" series library for €/$ 199.00). IK Multimedia had wall to wall presentations of SampleTank 4 (199.99) and AXE I/O, ($349), their new guitar focused I/O. 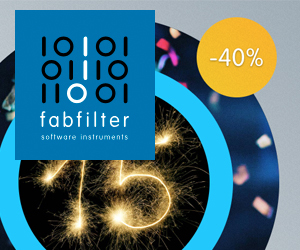 SampleTank 4 has a re-designed and scalable (woohoo!) 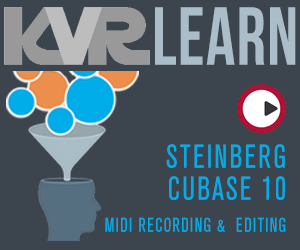 interface, improved streaming performance, and an expanded (now 200GB) sound library. The AXE I/O is something they're particularly proud of. It's a high-end (except for the price) guitar I/O with a variable HiZ input that interacts with a guitar's pick-ups for a wide range of tonal flexibility. 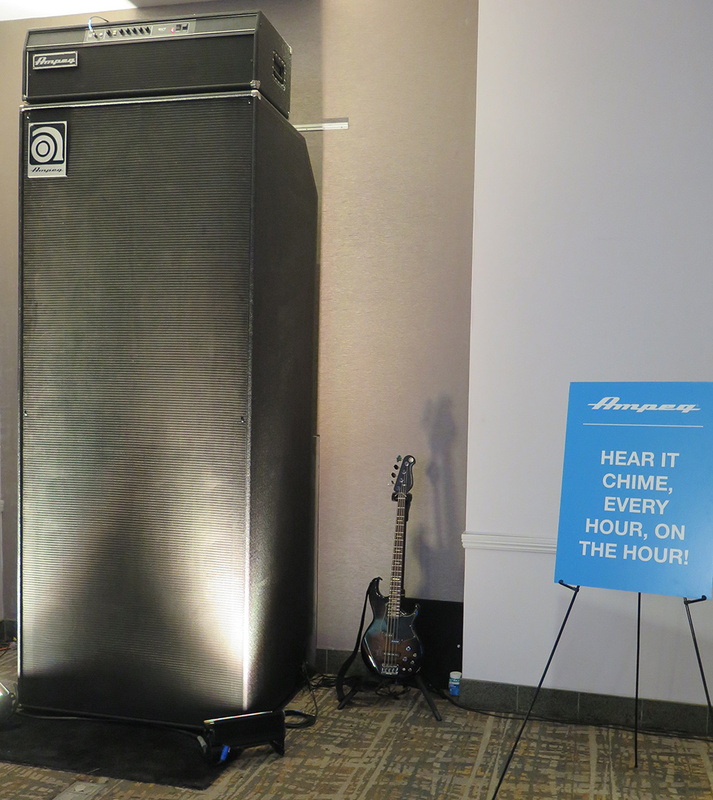 Most clever NAMM press event award goes to Toontrack, who are celebrating their 20th anniversary. They rented a large house through AirBnB, which lodged most of the Toontrack employees at the show. Each night different groups of paparazzi were invited to the house. After feeding on delicious Carnitas and guzzling beer, guests were presented with Toontrack's 2019 product roadmap, which, as a fan of the company, is quite exciting. 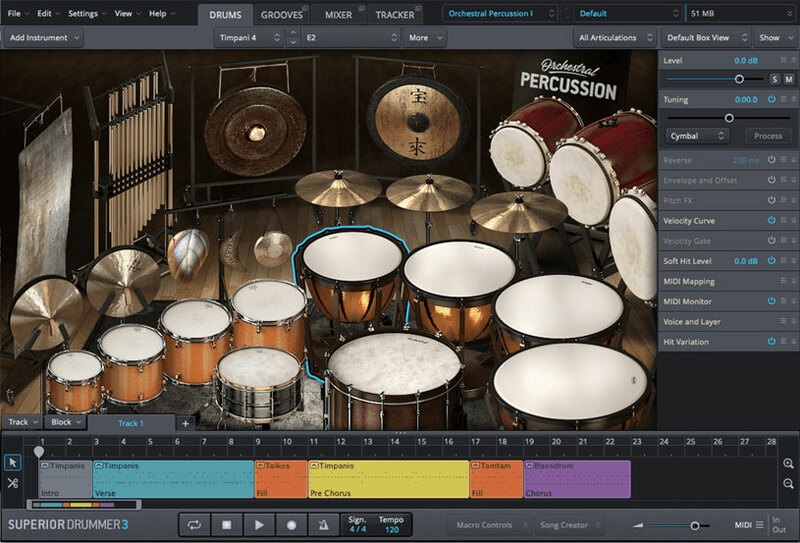 The first spring release, will be Orchestral Percussion SDX (Price TBD) which fills a hole in their Superior Drummer 3 line. Just about anything you can strike, pound, smack, shake, or wiggle has been deeply sampled at Galaxy Studios in Belgium by two generations of the Leo Ouderits family, which is an interesting story by itself (warning! ability to read Flemish required). Another major Toontrack announcement was EZBass, which will deserve its own post soon enough. 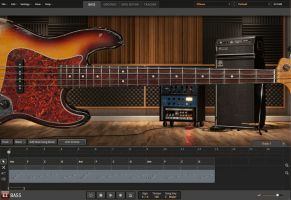 The short description is a sampled bass library that uses an intelligent technology similar to what EZDrummer and Superior to help songwriters add a realistic sounding bass player to their creations. Junk food and tins of tuna will still cost extra though. 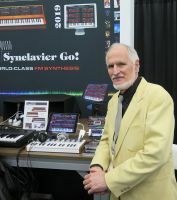 Speaking of people who have been around a while, and if you looked around a while, you would find the Sequential-then Dave Smith Instruments-now Sequential again, booth. They recently re-acquired the rights to their original revered brand, and were demonstrating the Prophet X ($3999-$4399), which is partially a collaboration with noted deep sampling sound designer Troels Frohman. Troels' company 8Dio will be providing additional compatible sound libraries. If you are thinking about building a business, there is a lot to learn from the Sequential story; innovation, persistence, consistent teamwork and loyalty, and above all, knowing your past. And then there's Eventide, surely one of the most innovative hardware companies in the history of pro audio. They have slowly but surely released software versions of most of their historic products. 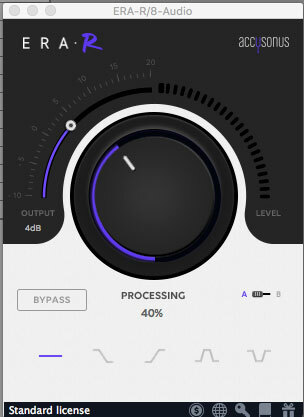 The latest is the Instant Phaser Mk II plug-in, which they say features all the unique and imprecise analog character of the original hardware from 1972, with updated and refined features such as Age and Mode. The Age knob emulates variable component-drift that occurs with aging hardware. The Mode switch offers three different flavors of phasing: Shallow, Deep, and Wide. Finally, Presonus introduced their new line of USB-C (or a subset of Thunderbolt 3 if you're an Apple non-conformist) audio interfaces. 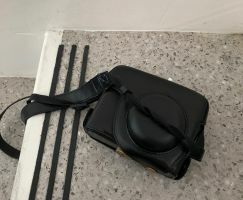 They have the usual high-level specs and you're going to need one if you want to connect to any of Apple's current laptops without using an adaptor. They were also showing Notion 6.5, which offers unprecedented integration with their Studio One DAW. 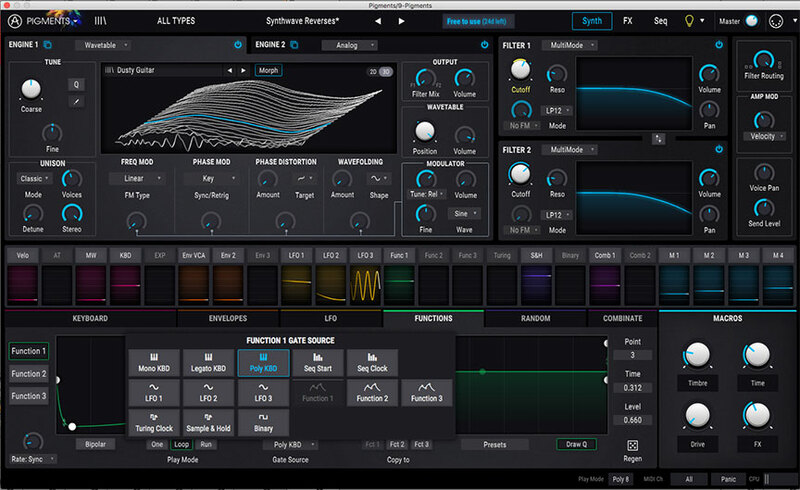 At the Spectrasonics booth, Omnisphere ($499) is up to version 2.6. 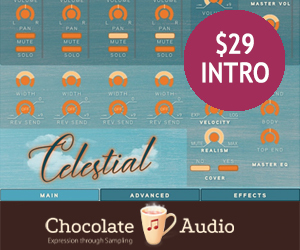 The new version adds a lot more capability to their already excellent arpeggiator. 2.6 also adds many more hardware profiles for use with external devices, including the fabled Roland D-50. In fact, Eric Persing was able to create the Soundsources from the original samples for the D-50 in 1987. Roland allowed to Eric use them because they were extracted from Eric's personal sound library at the time. Version 2.6 will be a free upgrade to all version 2.5 owners. 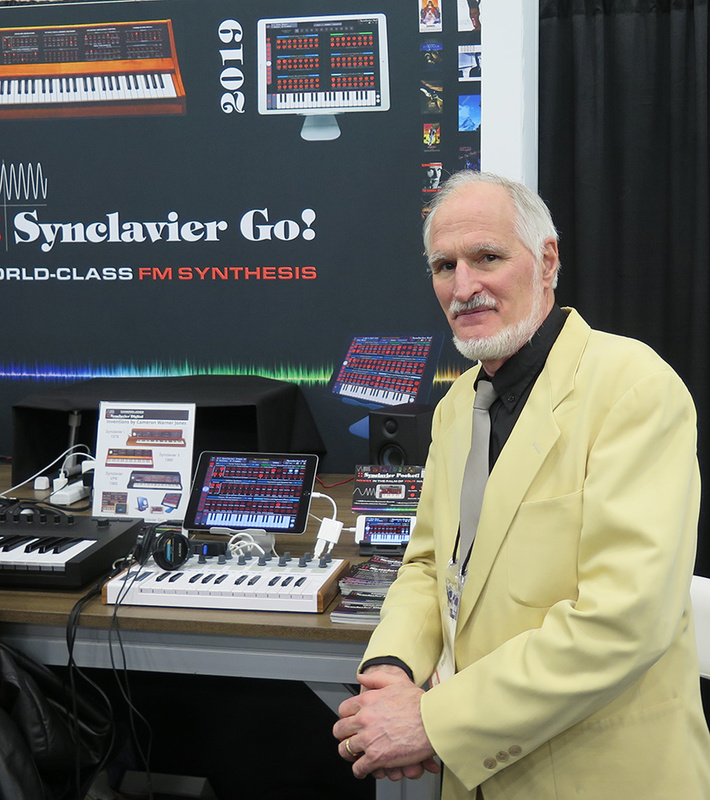 One of the earliest companies to use FM synthesis was New England Digital, which was the developer of the Synclavier. The irony is that NED was born out of the electronic music program at Dartmouth College in New Hampshire, which is about as far from Stanford University in California, where FM was invented by John Chowning and licensed to Yamaha in 1973, as one can get in the continental US. There were a few other FM synth products. UVI was showing their FM Suite, which is a detailed library of sounds from the huge number of FM Synths that Yamaha and others have marketed since the late 70s. The sounds include instruments like the dual 6-operator DX1 and 8-operator FVX-1, to the early GS2, and of course the extremely popular DX7, which was released in 1983. 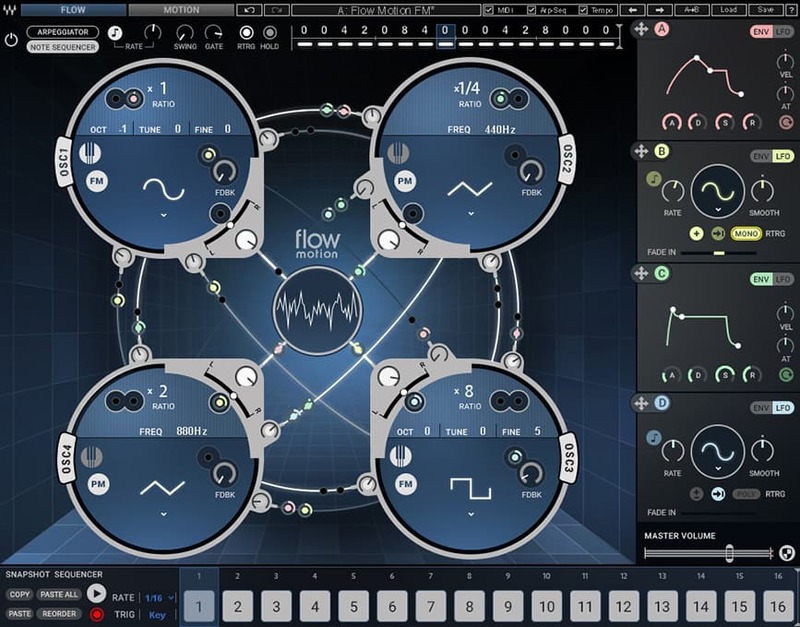 Waves was showing Flow Motion FM Synth ($49), which is a hybrid of frequency modulation (traditional FM) synthesis, and analog-style subtractive synthesis. 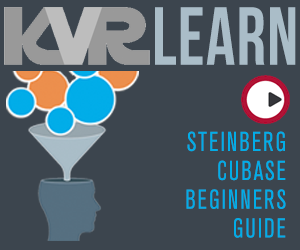 Their unusual GUI design is intended to flatten a user's learning curve with FM synthesis. 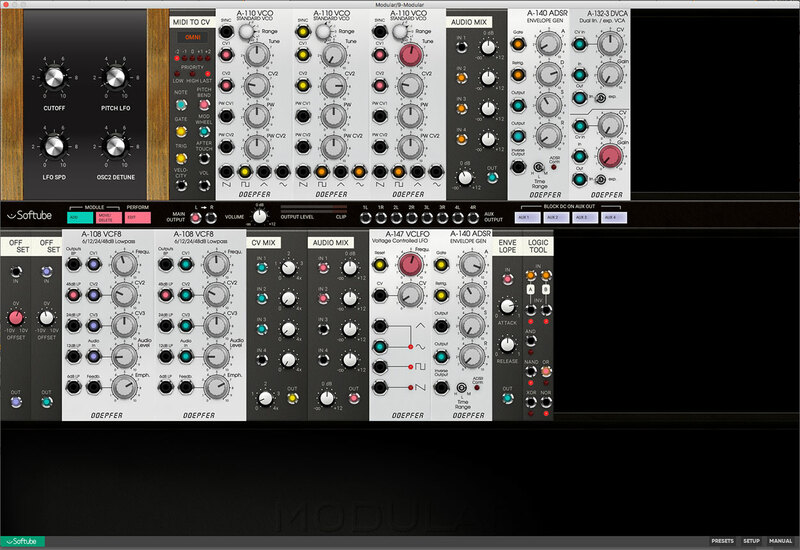 Various modifiers can be inserted into the signal paths of its 4 oscillators using drag and drop. They were also showing Bass Slapper ($49), an interesting approach to getting more expression from a slapped bass sample library. 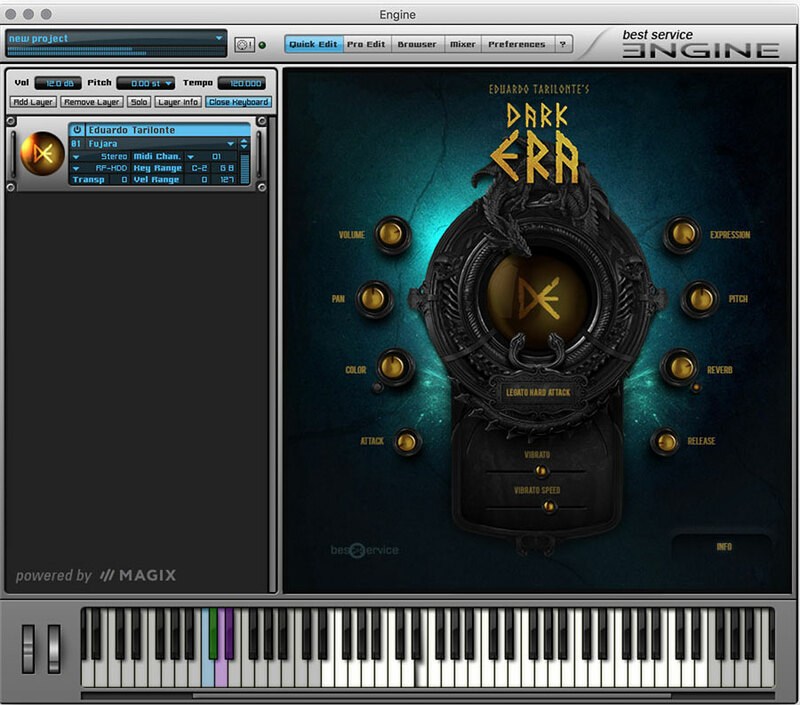 The UI allows the user to change the samples to reflect the player's hand position on the bass. Pretty nifty. With most of the growth in the acoustic guitar space, and Gibson and Fender competing for who has the best "artist model" there's not much to say about the electric guitar market. The best electric instruments are being made by smaller boutique companies like Tom Anderson. On the other hand, there were plenty of new products for guitar players. Kemper was showing a new software editor for the Kemper Profiler. 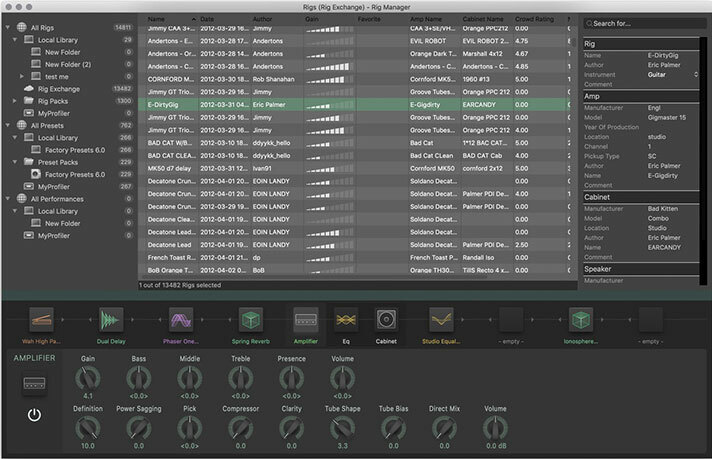 The existing Rig Manager allows storage and sharing of presets. 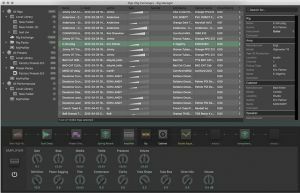 The new editor, which will run on a Mac or PC, allows users to edit any parameter of the Profiler, and more easily track automation from a DAW. It will ship sometime in the first part of 2019, and be free to Profiler owners. Fishman was showing the new TriplePlay Connect ($199 w/ free iOS app), which takes their pitch-to-MIDI technology and connects it via USB and Lightning to an iOS device running an awesome mobile app that they have created. 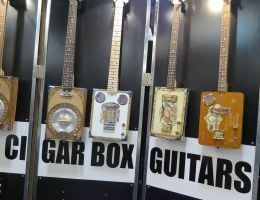 Fishman is one of the world's largest suppliers of acoustic pickups, and their booth featured a stream of artists playing all kinds of stringed acoustic instruments from around the world. 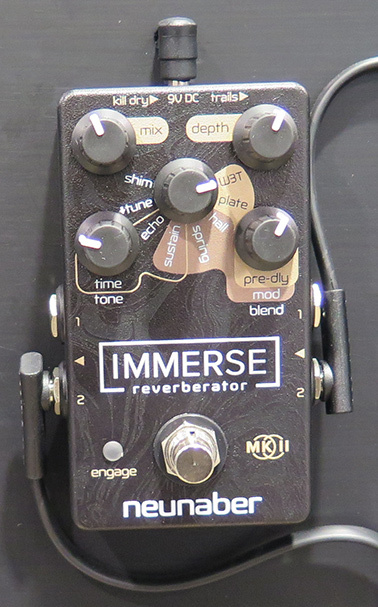 Boutique effects pedal company Nuenbauer was showing Immerse 2 ($199), their next generation reverb pedal that houses 8 stereo reverbs — Wet, hall, plate & spring reverbs, and 2 shimmers, Wet+echo, and Wet+detune. There is also a Sustain knob that allows for almost infinite sustain. All in a small stompbox. It's pretty impressive. Line 6 was showing their G10S wireless system, which effectively addresses a couple of drawbacks of the first generation of this incredible easy-to-use product. The G10S has a 9-volt power connector for people that want to mount them on pedal boards and didn't like how easily the mini USB power connector could fall out of the socket. It now has a 130' line of site range. There is a LED tuner built in, and a knob to change bands in an instant. With polarizing politics, 24-hour news, and social media, life is really complicated these days. Enter a couple of companies who want to make life simpler. iZotope, who specializes in simplifying complex tasks, returned to NAMM after being absent for a few years, and announced a new collaboration with KORG. 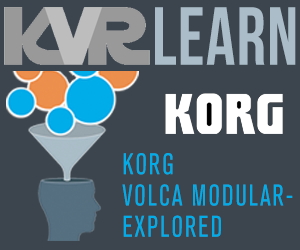 iZotope's mastering software, Ozone Elements ($129 value), will now come bundled with KORG's MIDI controllers, including the volca and MicroKey series. iZotope was also showing their Creative Suite, which includes seven of iZotope's plug-ins; VocalSynth 2, Iris 2, Stutter Edit, Mobius Filter, BreakTweaker Expanded, Trash 2 Expanded, and DDLY Dynamic Delay. 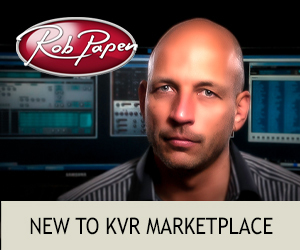 First, in the (drum roll please) KVR Booth, Ignite Audio was demonstrating their 2018 KVR Developer Challenge winning ProFET plug-in. Since winning the challenge they have been working hard on hardware, and they were also showing their Tube Griller pedal. Founder Alex Tsifidis was in the booth of Greece-based Accusonus. They have a similar vision to Izotope in that they are making products that are easy for people that don't do audio repair for a living, and making the process faster for those that do. 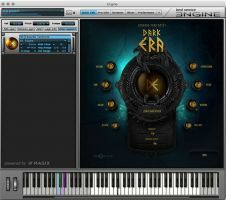 Their ERA Bundle ($149) is a good example of their work and they were demonstrating the six 1-knob audio repair plug-ins included in the bundle. 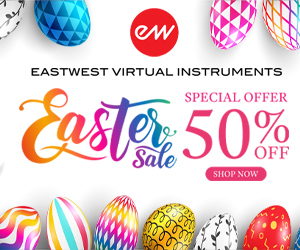 The plug-ins include ERA Plosive Remover, and ERA Voice Leveler, which have already proved to be useful for both professionals and amateurs repairing vocal and dialog tracks. 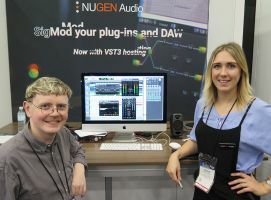 UK-based Nugen was showing their new version of SigMod. The new Insert module hosts previously unusable VST3 plug-ins within Pro Tools and Ableton Live, and reduces the need for multiple SigMod instances by incorporating third party FX directly into SigMod's signal flow. Sweden-based Mind Music Labs has announced ELK, a new technology that is similar to what Muse Research was doing a few years ago, using Linux as an OS to make computer-based hardware behave in a more musically useful manner. They've also done something really smart, which is to team up with Propellerhead to support Rack Extensions. 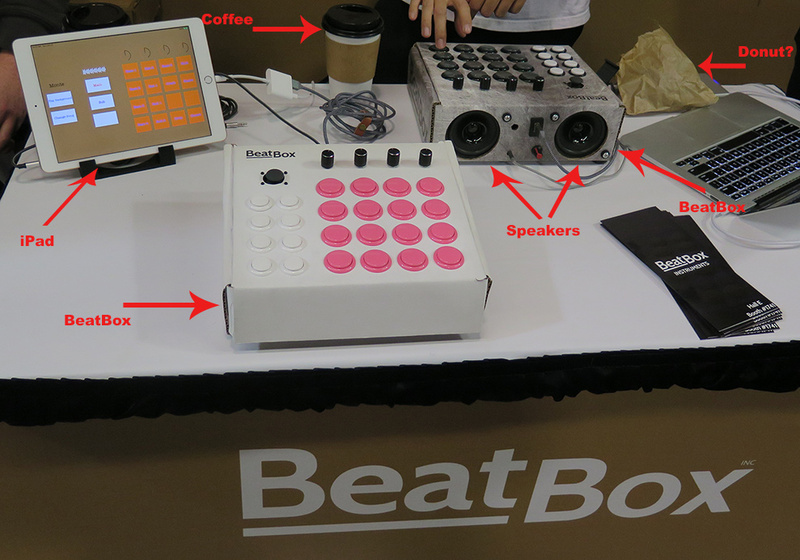 Other than the Strymon there wasn't a lot going on in Hall E, although the most eco-Friendly product award goes to the BeatBox (around $120 - Shipping Spring 2019), which is a DIY drum machine that is made from cardboard. You actually assemble it yourself. If you eventually decide to sell it on eBay you can just stick a label on it. But, on the other, who doesn't need a cigar box electric guitar. 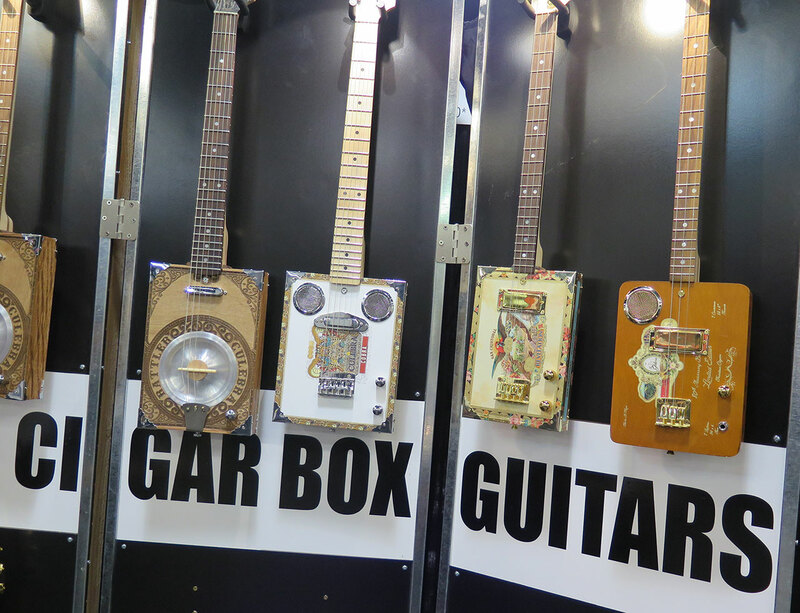 That's what was happening in the aptly named Cigar Box guitar booth. Before we buy one we'll need to know if they are allowed in night clubs. Finally, if anyone believes things are hopeless, consider that musicians, developers, and retailers of music gear are honest. 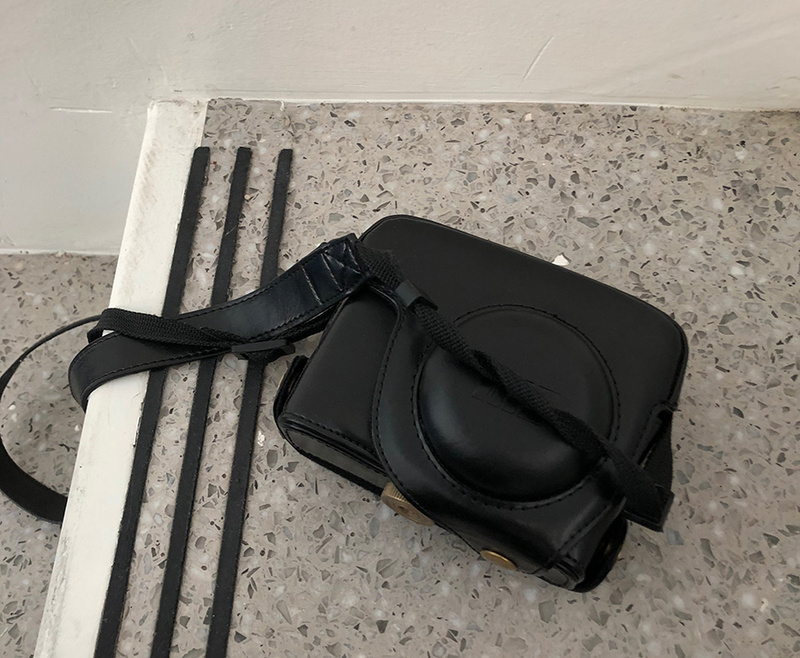 Someone left their camera on a table during a meeting and was very pleasantly surprised to find it exactly as he had left it two hours later. Nice. 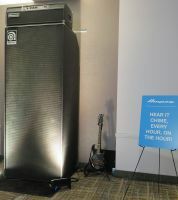 Big amp or tiny guitar?